I mean, what a relief from the development wars — it’s so refreshing to hear our city council members being accused of selling out to exercise trainers instead of developers. Seriously, we are blessed that we are having this argument. 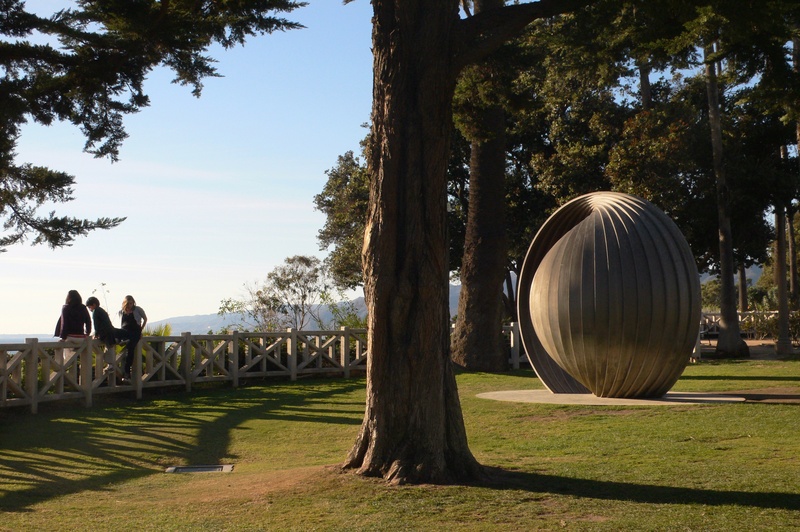 We are blessed that the founders of Santa Monica created public space in Palisades Park (although they might have blessed us with some big wide open spaces inland, too), and we are blessed that we use parks and care about how they are used. I say so because we shouldn’t take public space for granted. Not today in America. Consider so much of America built since World War II, where the most public of all spaces are malls. We live in a city where there are vibrant public spaces – not only parks like Palisades Park, but also the Promenade and the Pier. And streets where people actually walk! What if the closest thing you had to a main street was a highway lined with fast food drive-thru’s and strip malls? We live in a city. Cities (and real towns) have public spaces. Public space is not the same thing as open space, or natural space. Yosemite is the greatest of parks, but it’s not a public place — it’s not where people go to be with the public. Instead, it’s a place where people go to have an enhanced private experience (even if, or particularly if, the roads are clogged with others looking for the same). It’s the genius of park designers who are geniuses that they can create in city parks, in public places, the sense that you can be alone with nature in a place where you do not expect to be alone. What about the current controversy over trainers in our parks? With everyone all riled up I hate to be boring, but I have to give the City Council credit for adopting a good program to regulate exercise trainers in the parks, at least on a “pilot” basis that will be evaluated in a year. To begin with, I reject both extreme positions: On one hand, it was becoming intolerable (or had already become intolerable) to allow private trainers and exercise classes to dominate park use, particularly in narrow Palisades Park, for all the reasons you’ve heard (crowding out others, improper use of equipment, impacts on turf, etc.). On the other hand, a blanket prohibition of trainers and trainees wouldn’t be right either – i.e., it’s not surprising that after the vote to limit trainers, Santa Monica got ridiculed for “banning healthy people from parks.” Parks and exercise are a what you might call a good fit. City parks are for people to use. It’s ironic, but in the past neighbors’ complaints about Palisades Park have focused on the homeless “taking over.” Homeless people are attracted to parks when other people don’t use them. Trainers bringing classes to a park is a sign of a park’s success. But too much of a good thing is not a good thing. In this situation, you need to balance uses through regulation, and the council did a good job. (This is one of those cases where you think they must have done right since everyone – neighbors and trainers — seem to be mad at them.) They regulated how many trainers can use the park and where they can hold their workouts; the pricing seems fair and favors the use of other parks; the council banned trainers from Palisades Park on Sundays; and they regulated the use of equipment. Let’s give this plan a try and see how it works out. Zone #1: Palisades Avenue north to Alta. No personal or group fitness training by professionals is allowed north of Marguerita Avenue at any time. No one on one training outside these zones. No not-for-profit training outside the zone and must have permit. Why should the seniors have to sacrifice their one beautiful spot for the trainers? I have long been so proud of SM for dedicating this most spectacular location to the seniors, a group that especially in LA, is completely ignored. Have you ever walked by at Sunset when a swing dance class is going on inside? It is absolutely beautiful. I’m sure every developer around would pay anything for that spot. Our elders should be honored, not evicted. Let’s keep it sacred for the older members of our community. Have you heard? It no longer is the Senior Center. In a two-step process, the Council4–O’Connor, Davis, O’Day, and Holbrook–are giving that to developers too. First they took it away from seniors, who they relegated to windowless rooms in the Ken Edwards Center on 4th St. Where, BTW, srs have to pay $15 to join WISE to participate in groups that were free at the Sr Center in Palisades Park. Now–without taking Senior Center off the building, so people who don’t know won’t notice–the City has totally lame, unadvertised, again fee-based programs going on there, which–predictably–are not succeeding. The next step is have a bigger building built there to take advantage of the view. What the Council4 did at 4th and Arizona, they will do again and again: give the City to developers, trainers, or anyone else who will pay, just not ordinary residents for free. The picture shown in Frank Gruber’s article is in proximity of the new Commercial zones. Fyi. The fees collected are less than half of what a trainer would pay at a facility. (Facilities in the neighborhood that are paying huge fees and overhead and contributing to our tax base). I wouldn’t expect to find commercial enterprise at Golden Gate Park either. In our case, a great section of Palisades Park is in a commercial zone, south of Wilshire. The Senior Center could be adapted to handle exercise classes offered through the city, just like all if Los Angeles does. After all Frank, the commercial area near the Senior Center was designed for what you are refering to unlike the residential areas north if Wilshire near the Rose Garden. How our council looks at this issue needs to be set in the total view. After all, how many residents realize that very soon our city will be severed into north and south at Colorado forever, with the light rail stopping north south traffic 10 to 20 times an hour at all prime intersections. And how do we fit in all the studies for density into this new ordinance. Frank, this article even more than the others I have read of yours shows that you really don’t care, you would densify and commercialize, by compromise, every inch of town if you could. The Sr Center has already been taken away from srs. The Council4 is ashamed of what they did, as they should be, and/or they don’t want anyone else noticing, so they left Sr Center on the building.